Vampire Darcy’s Desire presents Jane Austen’s Pride and Prejudice as a heart pounding vampire romance filled with passion and danger. 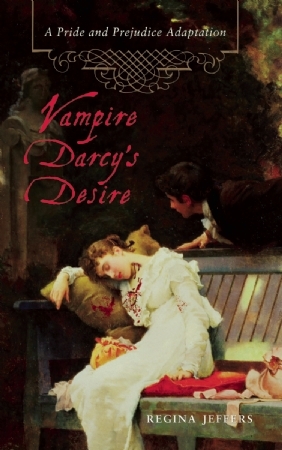 Tormented by a 200-year-old curse and his fate as a half-human/half-damphir, Fitzwilliam Darcy vows to live forever alone rather than to inflict the horrors of life as a vampire on an innocent wife. However, when he comes to Netherfield Park, he meets the captivating Elizabeth Bennet. As a man, Darcy yearns for Elizabeth, but as a damphyre, he is also driven to possess her. Uncontrollably drawn to each other, Darcy and Elizabeth are forced to confront a “pride and prejudice” never before imagined – while wrestling with the seductive power of forbidden love. Meanwhile, dark forces are at work all around them. Most ominous is the threat from George Wickham, the purveyor of the vampiric curse, a demon who has vowed to destroy each generation of Darcys. [This excerpt comes from the end of Chapter 25 of my 2009 novel, Vampire Darcy’s Desire. In this novel, Darcy carries the “curse” of vampirism, but he has made a pledge for the plague on his family to end with him. Mr. Wickham, who is the vampire in this novel, has taken Lydia Bennet in retaliation against Darcy and Elizabeth. Therefore, Darcy has confronted Wickham, and in the process has been taken prisoner. Elizabeth and Colonel Fitzwilliam have set out to save Darcy from his enemy. Darcy’s cousin, Damon Fitzwilliam, has learned of where to find Wickham. He will investigate before placing Elizabeth in danger. A quarter hour later, he stood before the church’s graveyard. Everything appeared quiet, but after the past hour of listening to two grown men excitedly share what they knew of the grave sites looming before him, Damon Fitzwilliam had to steel his nerves before proceeding. As rambunctious children, he and Darcy had often played soldiers, hiding behind family headstones in a pretend battle; and in the military, he had spent more time than he cared to remember with the dead. Yet this was different, and the colonel sensed it. In this cemetery, death lived. The colonel chastised himself for his fear and quickly crossed the mounds to exit through the shrubbery outlining the graves. A glance over his shoulder showed him a low, creeping fog spreading across the granite memorials. His drunken informants had told him that the house was behind the cemetery; they had forgotten to mention the hill and the wooded field. Luckily, light streamed from the house’s windows, serving as a beacon for him as he took unsteady steps on the hill, and the colonel made his way stealthily through the forested area to exit where the steps led to the kitchen. In the back of his mind, Damon reasoned how country homes would never be lit up as such at that time of night, but this was no ordinary household. Armed with cloves of garlic and a crucifix purchased in one of the small villages through which he and Elizabeth had passed, he edged the kitchen door open and slipped into a perfectly clean room. At first, its pristine appearance shocked him, but then he remembered that Elizabeth had told him that Wickham never ate regular food. The pots and pans and kettle were purely for show–Wickham’s playing at being the master of his small estate. Leaving the kitchen behind, Damon followed a staircase leading to the private living quarters, but again these offered no insights into how to defeat Wickham, because they stood unused–sparsely furnished–a mausoleum to an unemployed life. Only one room was locked, and although he wished to force his way into it and see what it might hold, a pulsating cadence caused him to curtail his search and find his way towards the center of the house. Drawn by the unusual sound, he crept on all fours. Damon edged forward to where the upper floors overhung the center hall. He glued himself to the wall, crouched so that he might respond if necessary, and looked upon what he could not explain. The sound increased as he peered between the slats of the railing to the room below. He feared that his presence might affect the show, but nothing stopped the accentuated movements as one after another shadowy eidolon entered a spiritual gambol. They turned and twisted and oscillated to an undulating rhythm. Periodically, one pasty form would hazard a challenge to another, and the room would fill with squeals of despair and of yearning before returning to the murmured chants. Then a creature as pale as the colonel had ever rose from his grotesquely adorned chair. He held out his hand to a pretty sort of girl with curls pinned tightly to her head. Then, horror of horrors, the image the colonel assumed to be George Wickham looked on in infinite sadness as the girl slid into his embrace. Wickham brought her closer still, swaying with her in a primitive invitation to passion. His hands searched her body, and then wordless voices rose in exultation as Wickham lowered his head and drank the girl’s blood. Damon bit back a cry of dark, piercingly pure contempt for the display. He shuddered in anguish at his inability to change what was happening to the girl. With a despairing gesture, he withdrew to the servants’ stairs. He must escape before the surging call of the coven sucked him into their fold. Slipping cautiously along the passageway, he rested a split second with his fingers on a door’s handle, before a muffled sound on the other side sent his heart racing. Frozen with fear, Damon prayed that what was on the other side would not find him. He pressed his ear to the door, listening with all his senses, but he heard only a soft wind. A mysterious presence moved through the closed portal, and the colonel could feel it so exactly, it was as if he had seen through the door. He knew the moment it moved on, and he eased the handle to the right, sliding the door aside only far enough to fit his body through before silently resettling it. Clinging to the wall, Damon stepped softly, trying to escape his fear and what had happened in this house. On the battlefield, he knew death danced all around him, but he had never felt it before, never knew it to fill his lungs like acrid smoke, never smelled the stench of decay so clearly. He felt totally unprepared for this battle. A door stood ajar on the other side of the hearth–a door not open previously, and despite his desperate need to flee the room and the house, Damon made his feet step to where he could peer into the space. Before him, Wickham paced to and fro, and then he stepped to the side, and the colonel had to stifle every impulse to rush forward to save his cousin. Darcy slumped against the wall, held in place by attached chains. Darcy was alive! Damon’s first instinct had been to storm the scene and fight Wickham to the death, but how did one kill something already dead? From a distance, he heard the murmuring increase, but Damon continued to watch as Wickham bent to taunt Darcy. The tension rose between the two, and for a moment, Damon thought that Wickham would attack Darcy also, but then he realized, The fiend had just fed; Wickham would not feed again so soon. And despite the number of vampires dancing ceremoniously in the main hall, Damon realized that Darcy’s enemy would allow no other to touch his cousin. Wickham would want to destroy Darcy himself. If he had wanted Darcy dead, Damon’s cousin would no longer be breathing. Assured that he could do nothing at the moment, Damon let himself from the kitchen’s perceived security. If what his drinking consorts said had been true, he was still not safe. Damon slipped the crucifix from his pocket and lifted his sword in readiness for any attack. He wove his way among the trees and climbed the hill, but when he reached the cemetery, Damon circled the hedgerow on the outside. Loudly repeating every prayer he could remember, he vigilantly watched as the fog he thought to be part of the countryside congregated solely in the church’s cemetery. From it, specters formed and disintegrated before his eyes. Some challenged his progress, but all retreated from the raised silver weapon he carried and from the sign of the Lord’s forgiveness. Reaching the road to the inn, Damon followed the embankment; the mist trailed him, but the spectral provocations–strange, unheard presences–kept their distance. He congratulated himself for having left the horses at the inn. A nervous mount would serve no master. Damon kept up his litany of invocations and refused to look about to see what might await him. He figured the prayers would not hurt, and they definitely made him feel safer. When he arrived at the inn, Peter let him through the locked door. Damon had set the man on guard when he had departed for Wickford Manor, and he was thankful for his foresight. He handed the garlic and the crucifix to Peter. “Keep them close,” he warned. “I saw what followed you, Colonel. If these keep that evil away, ye won’t be able to pry them from me.” The coachman bolted the door. “Will they not try to enter these premises?” He listened closely to the night’s howls. “This is so more than for which we bargained, Peter, but those creatures must be invited in by someone who lives within. No one will act so foolishly.” Damon leaned against the door to steady his nerves. “The Mistress will certainly be glad to hear it.” The servant settled onto the straw-stuffed mattress. Damon allowed his gaze to travel up the stairs, resting it on Elizabeth’s door. “Mrs. Darcy is an exceptional woman. Good night, Peter.” He knew she would be awake, waiting for his news. Slowly, he climbed the steps; they had a daunting task ahead of them. What if we cannot save Darcy? “Someone looks for you, Darcy.” Wickham had paced the room, agitated by the intrusion into his home. Darcy attempted not to react; he forced his breathing to remain even, but the joy of knowing another knew of his capture played havoc with his composure. He kept his eyes closed, fearing that Wickham could read his countenance. Wickham walked away casually, although he knew apprehension. “It was your beautiful wife, Mrs. Darcy.” Wickham straddled a straight-backed chair, turning it to where he could watch Darcy’s reaction. “Probably a stranger enticed by tales of the unknown.” Darcy hoped to convince his enemy to ignore the incursion. At first the words were offensive, but then Darcy’s pity replaced his anger; and despite his personal loathing of Wickham’s baseness, he suddenly experienced empathy for what once must have been a proud and handsome man–a man who had loved a woman too well and lost everything because of it. “I have not tasted it,” Darcy spoke softly, not wishing to break the understanding between them. Darcy forcibly relaxed the pain in his shoulders and arms. Wickham had imprisoned him twenty-four hours prior, and other than the occasional break he had negotiated to meet his personal needs, Darcy had remained restrained by the shackles. Wickham, as he expected, had brought him no food or drink; he was to die of starvation, and Darcy accepted it. “You will inform me when you make the choice, will you not, Wickham?” he mumbled as he closed his eyes and welcomed sleep. He heard the door before him close and knew when the bolt slid into the latch, but Darcy remained in repose. Images of Elizabeth filled his mind; remembrances of their time together overspread his thoughts as sleep found him. This entry was posted in gothic and paranormal, holidays, Industry News/Publishing, Ulysses Press and tagged Elizabeth Bennet, Fitzwilliam Darcy, Jane Austen, Pride and Prejudice, Ulysses Press, Vampire Darcy's Desire, vampiric tales. Bookmark the permalink.